Review posted May 15, 2014. Philomel Books, 2014. 32 pages. Here’s a beautifully illustrated picture book about a little girl who wants to be a ballerina. Sounds trite? What gives this book extra power is that the little girl is black and lives in Harlem in the 1950s. Her mother works for the ballet school, cleaning and stitching costumes. One day, the Ballet Master sees the little girl do an entire dance in the wings, from beginning to final bow. After that, he makes an arrangement for her to join lessons each day from the back of the room, even though she can’t perform onstage with white girls. She asks me to demonstrate a movement for the whole class. With every bend, I hope. every grand jete, I hope. And then something life-changing happens. She sees an announcement that Janet Collins is going to perform at the Metropolitan Opera House, the first colored prima ballerina. Her Mama makes sure she gets to go. showing me who I can be. dripping all my dreams onto my Sunday dress. The picture shows a close up of Janet Collins in the middle of a leap in front of a packed opera house, with the girl in a graceful leap right beside her. On November 13, 1951, four years before singer Marian Anderson’s Metropolitan Opera debut, dancer Janet Collins became the first African American hired to perform under contract with the Metropolitan Opera. Though she had been denied the opportunity to dance with other ballet troupes because of the color of her skin, Met Ballet Master Zachary Solov was so taken with her skill and beauty as a dancer, his choreography of the opening night opera was inspired by her movement. Rudolf Bing, general manager of the Met from 1950 to 1972, considered his greatest achievement to be having hired Miss Collins, breaking the barrier that existed for African American performers of the era. Miss Collins’s performance on opening night and the fact that she was “colored,” as African Americans were called at that time, were both highly publicized in advance. 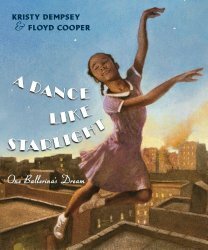 Though I have only imagined this little girl and her mother were at the Met to see Miss Collins perform, I hope many women, regardless of their age or the color of their skin, are inspired to achieve their own dreams through her historic performance. As if the inspiring story, with its discussion of wishes versus hope, weren’t enough, the art by Floyd Cooper is simply beautiful. This is an uplifting book in every way.